At its IFA press event at the beginning of this month, Samsung ended its Gear S2 announcement by teasing an upcoming big tablet called Galaxy View. 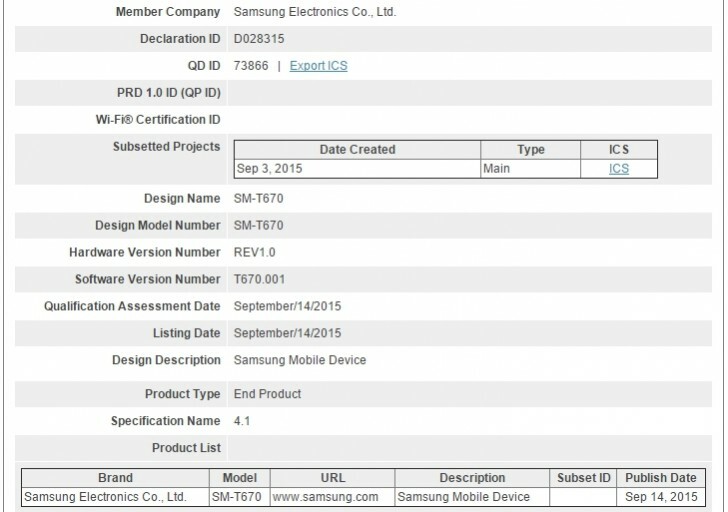 Although the Korean company did not out any other details, we've only had one huge Samsung tablet being rumored recently. According to past leaks, its model number is SM-T670. And now a mobile device bearing that exact same model number has been certified by the Bluetooth SIG. Although we can't yet be sure this is what's going to be sold as the Galaxy View, it's really unlikely that the company would out two different huge tablets running Android in the next few weeks. After all, with a rumored screen size of 18.4", the T670 (or Galaxy View) would be a niche device at best. Two of them would thus make little sense. So we assume that this is in fact the Galaxy View. The certification means it will almost surely launch before the end of the year, though it's still unclear when exactly. It should come with a TFT LCD touchscreen with 1080p resolution, the Exynos 7580 SoC with a 1.6 GHz octa-core CPU, 2GB of RAM, 32GB of expandable storage, an 8 MP rear camera, a 2 MP front-facing camera, and a 5,700 mAh battery. It will reportedly run Android 5.1 Lollipop. I've heard the price is going to be only 319.99$. Is this right? You're crazy nway is a 18.4" tablet is going to sell for that low of a price.